Who doesn’t love Bacon!!? It’s one of the most delicious treats out there. With a crispy, salt flavor that makes any food delectable and amazing it’s just so delicious to eat. Add it to any dish and it goes from yummm to wow! Bacon has become a popular addition to many recipes. Whether you add it to something salty or add it to something sweet, your dish will be a hit with this delicious addition. Bacon has become a must have in many top recipes. So it’s only natural to make it the guest of honor at any event. 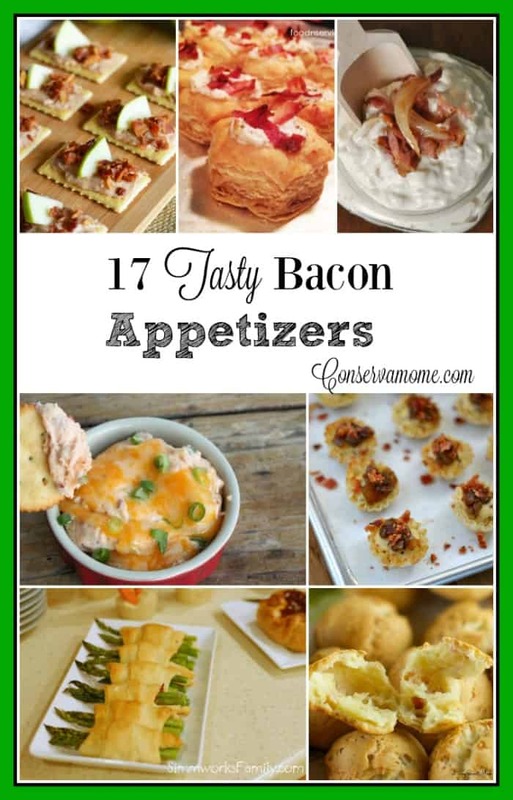 Here’s a list of 17 Tasty Bacon Appetizers that will make any party a huge hit. These recipes are easy and delicious. Can be used as a sweet or savory start to any gathering of right. Now that you have a list of these fantastic and delicious recipes make sure and add them to your next party or gathering. These are sure to be a huge hit wherever and whenever you use them! All of them now please. Bacon makes everything better. The Bacon Cream Cheese Bites sounds awesome! Nice to have so many bacon recipes in one place! At our house, bacon is a food group! Some great sounding recipes here. Who can resist anything with bacon? Bacon makes everything taste better. Thanks for these delicious recipes. These look amazing! I’ll definitely be trying them for tailgating this fall. These all sound so yummy! I will have to check them out and add them to my pinterest acct. My husband and sister in law are HUGE bacon fans. I’ll have to give some of these a try! You can’t really go wrong with bacon. We’ll be trying some of these soon! Bacon Caramelized Onion Dip With Philadelphia Cream Cheese from Just Us Four sound amazing and I have to add them to my recipe list ASAP! Thanks for the great roundup! Holy cow bacon cheeseburger quesadilla. OhmyGeeeeeee wow it’s on lol how delicious! 🙂 Happy mothers day! hubby would enjoy these very much. Bacon is one of my favorite foods, so I’m going to have to try some of these! The bacon caramelized onion dip sounds delicious! I love bacon. We ate it for breakfast this morning. You hit it with this one! Thanks for sharing! All these sound so good. I wish I had bacon in the fridge right at this moment! I love putting bacon in quiches with leeks too. Can’t wait to try some of these tasty treats. We love bacon at our house! These look amazing! Who doesn’t need more bacon in their life. My son loves bacon! Thanks for all the yummy recipes! My husband loves bacon so I am going to have to cook up a few of these recipes! These are awesome, my husband loves bacon! You’re right! Who doesn’t love bacon? Today my 4.5 yr old ate 4 pieces of bacon and a couple nibbles outta his fresh eggs! Wow…thanks for all the bacon recipes. They look delicious. I don’t know which recipe to try first. They all sound delicious! I’ll have to try these with turkey bacon!